JAMIE STOBIE'S career in documentary films spans nearly thirty years. She is co-producer of What about God?, the last hour of the WGBH series, EVOLUTION which aired on PBS on 2001. She produced Life Beyond Earth, a two-hour film special on the history of space exploration and the scientific search for extra-terrestrial life with author Tim Ferris, broadcast on PBS in 1999. She was executive producer for They Drew Fire, a one-hour documentary about the soldier artists of World War II, narrated by Jason Robards. Jamie has been line producer, production manager and associate producer for numerous documentaries including Jon Else’s acclaimed series based on the Pulitzer Prize winning book, Cadillac Desert, about the history of water in the American West; Livelyhood, The Working Group’s series about the changing American work place; American Crime and Punishment, Bill Jersey’s documentary special on criminal justice; and We the People, KQED/San Francisco’s four-part series on the Constitution hosted by Peter Jennings. She began her film career in 1977 on the staff of Cosmos, the Pulitzer Prize winning documentary film series about astronomy with Dr. Carl Sagan. JANET COLE was the Producer and Executive Producer of Regret to Inform, for which she received Academy Award and Emmy nominations and a 2000 Peabody Award. She also produced the Emmynominated Paragraph 175 with directors Rob Epstein and Jeffrey Friedman for HBO; and Absolutely Positive with director, Peter Adair for the BBC and PBS, winner of the IDA’s Distinguished Documentary Achievement Award. Her executive producer credits also include Heart of the Sea (PBS, Independent Lens 2003), Promises(PBS /POV 2000; winner of two Emmy Awards; Academy Award nominee) and the upcoming FREEDOM MACHINES, which will have its PBS broadcast on POV in 2004. Throughout the 1980s, she designed distribution campaigns for independent films and worked with such classics as Word is Out, The Life & Times of Rosie the Riveter, The War at Home, Gal Young ‘Un, and Soldier Girls. In the mid-1990s, she conceived and supervised production of a 4-hour series called Positive: Life with HIV for the Independent Television Service (ITVS). As a consultant, she works frequently with independent producers and organizations. Her clients have included ITVS, PBS, Corporation for Public Broadcasting, the John D. and Catherine T. MacArthur Foundation, the Sundance Institute, and the American Film Institute. She is a member of the Academy of Motion Picture Arts & Sciences. 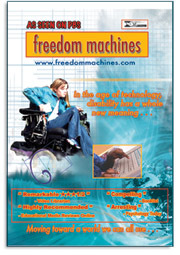 Richard Cox originated the FREEDOM MACHINESfilm concept. A computer consultant who has produced traditional and computer animation shorts, he became involved with assistive technology over eighteen years ago when exploring how personal computers can be adapted to help children with disabilities. He is continuing to apply his interests in film, animation and computer graphics toward helping individuals research and adapt technology systems to their personal needs. Ken Schneider has edited social issue documentaries for 12 years. His films include Regret To Inform, winner of a Peabody Award and nominee for both an Academy Award and an Emmy; Ralph Ellison: An American Journey for American Masters; the Columbia- Dupont winning School Colors for Frontline; The Good War and Those Who Refused To Fight It; Store Wars: When Wal- mart Comes To Town, and Making Peace: Healing the Community, all broadcast on PBS. Robert Elfstrom has shot numerous award-winning PBS and NOVA documentaries. Recent credits include Cathedrals of the Sky for Discovery Channel, Paul Rodriguez Behind Bars, and Extreme: Sports to Die For for HBO, The Lost Children of Rockdale County and Blackout for Frontline, and a two-part PBS series, Life Beyond Earth. Todd Boekelheide started working in film in 1974 as a member of the staff at American Zoetrope, Francis Ford Coppola’s production company in San Francisco. In 1976 he left to work as an assistant editor on Star Wars, and went on to edit picture and sound on The Black Stallion two years later. This film kindled an interest in film music, so he began music studies at Mills College in Oakland. As he began to develop his film scoring career, he also specialized as a rerecording mixer, and won an Oscar for mixing the music on Amadeus in 1984. He has scored several feature films, including Dim Sum and Nina Takes a Lover, and numerous documentaries, notably Hearts of Darkness:A Filmmaker’s Apocalypse. In 1999 he won an Emmy for his score for the documentary Kids of Survival:The Life and Art of Tim Rollins and the KOS. Up-to- date credits information can be found at www.tobomusic.com. With his supporting role in Tom Decillo’s Living In Oblivion, actor Peter Dinklage - as dwarf actor ‘Tito’  delivered an open rant to an entire generation of would-be filmmakers, refusing to be used as a gag or a prop  while honoring his craft with an unforgettable fierceness and dignity. Now, Dinklage has redefined the concept of a leading man with his starring role in the 2003 Sundance Audience Award winner The Station Agent, for which he was recognized with a “Best Actor” nomination in the 2003 Independent Spirit Awards, as well as being named one of the top 5 “Breakout Stars” of the year by Entertainment Weekly. Recently, Dinklage was prominently featured in People’s “Sexiest Man Alive” issue. He is also set to star in an upcoming (2004) production of Richard III at the Public Theater in New York and a Lincoln Center production on the life of painter Henri de Toulouse-Lautrec for director Martha Clark. Sharon Wood received a Northern California Emmy for And Then One Night: The Making of Dead Man Walking. Her credits also include KPFA On The Air, which aired on PBS, Paragraph 175 for HBO, Isamu Noguchi for PBS’s American Masters, and three Oscar nominated films during a two decade career. Betsy Bayha currently works in the documentary department at Lucasfilm Ltd. in San Rafael, CA. She has worked in public broadcasting for more than fifteen years and was Associate Producer on Nightshift and The Workday that Wouldn’t Die for the PBS series, Livelyhood, about the changing workplace. She was a principal scriptwriter on the Discovery Channel series, Serendipity about serendipitous medical discoveries and was an on-air reporter at National Public Radio affiliate KQED for almost a decade. As a person with a disability, Betsy has a strong interest in stories about disability issues.